Dbs Administration Pty Ltd (Queensland, Brisbane) is the location of the Apache server. Its 2 nameservers are ns1.fabulous.com, and ns2.fabulous.com. 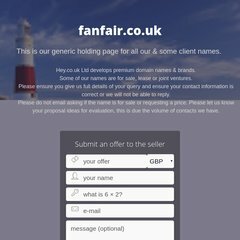 Fanfair.co.uk's server IP number is 208.48.81.133. PING www. (64.15.205.101) 56(84) bytes of data.